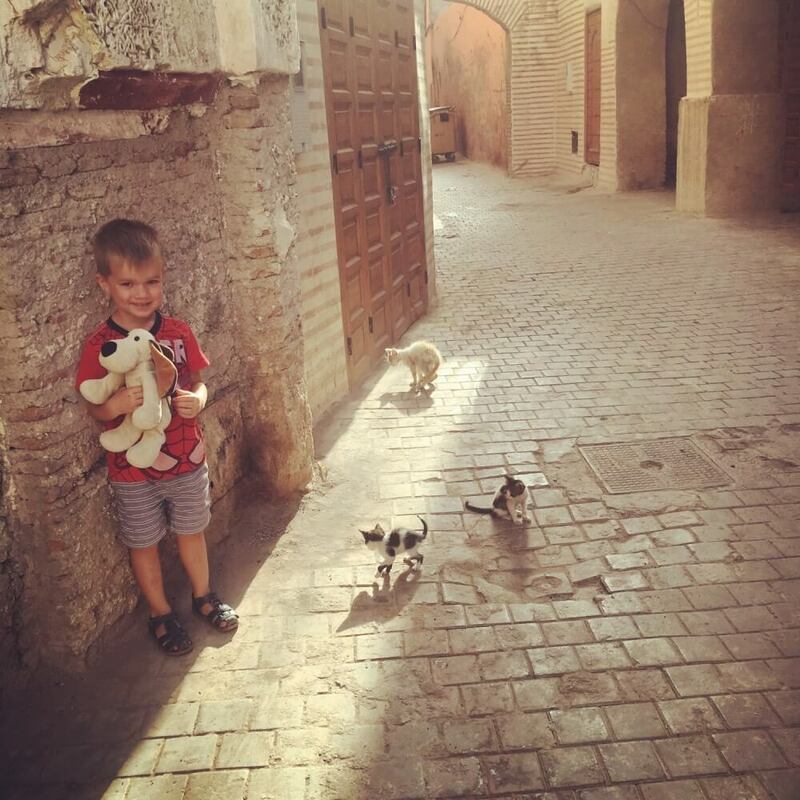 A Marrakesh family holiday (also known as Marrakech) in Morocco might not be the first option that springs to mind when you’re thinking of places to travel with your kids, but we had such a great time exploring when we travelled for 3 days in Marrakech. 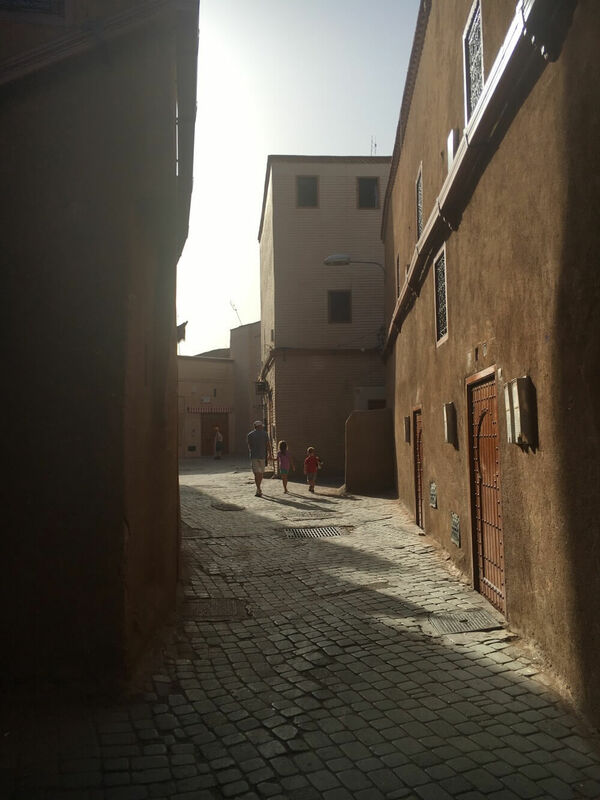 Here’s our low down of visiting Morocco with kids and our guide to the best places to visit and things to do in Marrakesh with kids. Wandering through the narrow alleyways in the UNESCO heritage status medina (old part of town) is one giant game of hide and seek! The twisting labyrinths and rustic alleyways make for fun times! 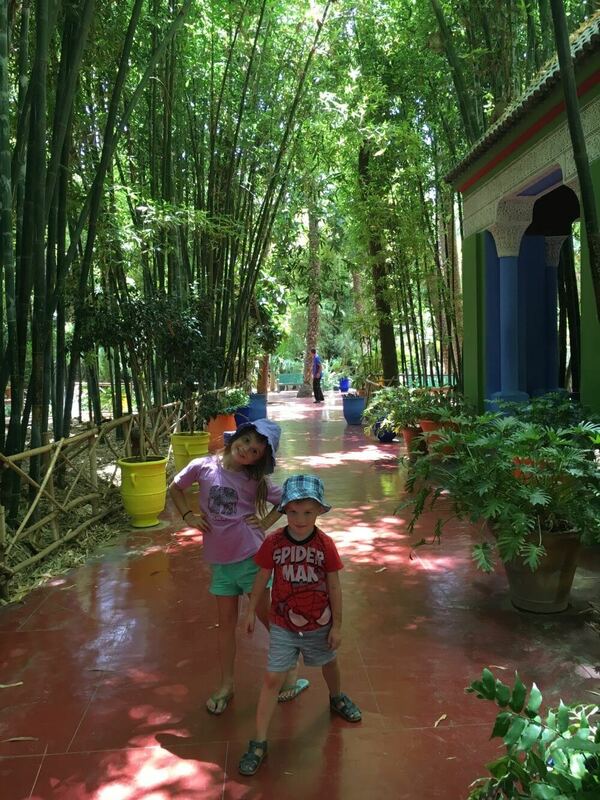 Our kids loved exploring all the nooks and crannies and especially liked it when we got lost as you inevitably will! The locals are very quick to help and point you back in the right direction. There’s also plenty of taxis and buses on the outskirts of the medina to help get you back to your destination if you’re lost. 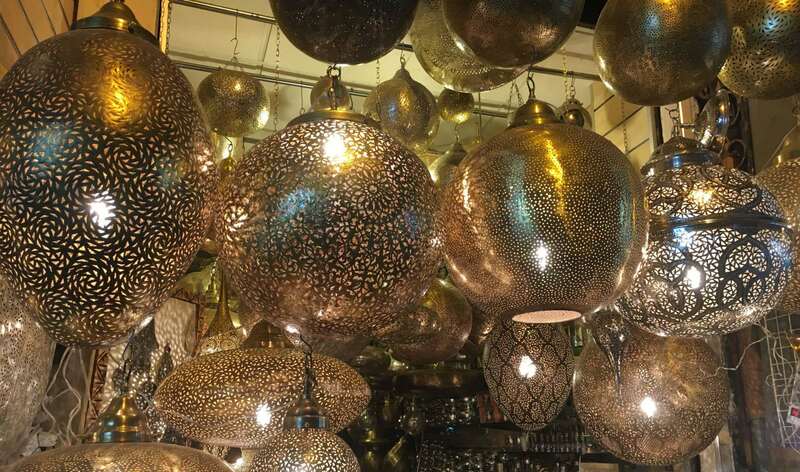 The souks are giant marketplaces full of all kinds of treasures like ceramics, metalwear, stunning fabrics, spices and baskets. 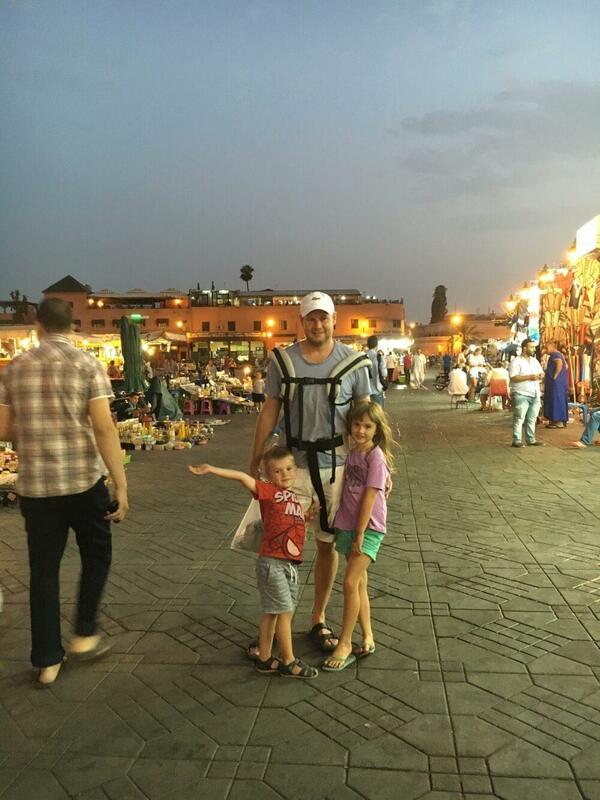 We really enjoyed browsing through the various souks in Marrakesh and good natured haggling when purchasing some little momentoes of our trip. The stunning Jardin Marjorelle is a great place to head to get away from the hustle and bustle of the medina. These beautiful botanic gardens were created over 40 years in the early 20th century, and then purchased by Yves Saint Laurent and Pierre Bergé in 1980 who restored the gardens to their former glory. 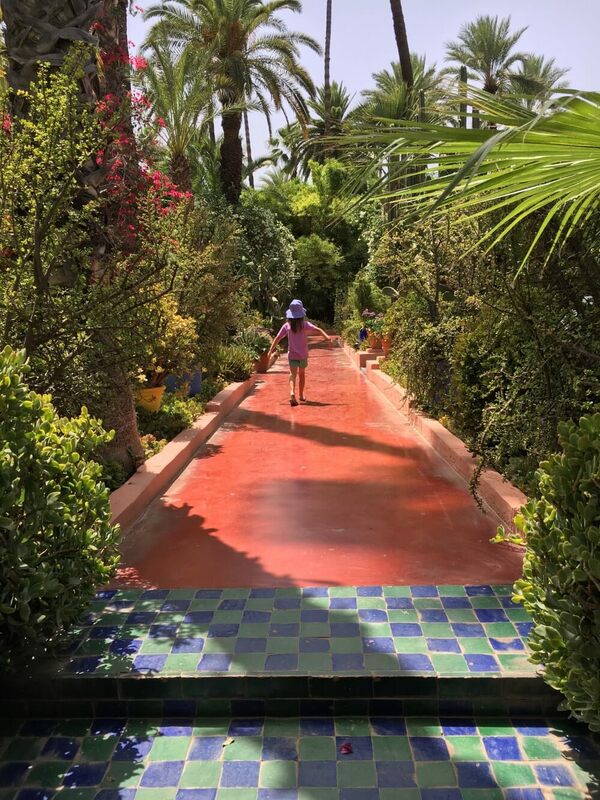 Jardin Marjorelle is a fabulous place to wander through and cool off and be sure to take your camera to capture pics of your kids next to the vibrant blue and yellow architecture. Jeema el-Fnaa is the UNESCO heritage status famous square and marketplace in the medina that’s centuries old, and kind of the point that’s Marrakech city centre. Sunset is a great time to visit and our kids were fascinated watching the snake charmers and magicians at work. As it gets dark the square fills with lots of enticing smelling food stalls and giant trestle tables are filled with people eating from the food stalls. The square is also lined with vendors selling the most amazing orange juice you’ve ever tasted all for a few cents! It’s an absolute must-try and one of the top things to do in Marrakech. As one of the top things to do in Marrakech at night, the atmosphere is incredible particularly when combined with the background call to prayer as night falls. Another must do in Marrakech is the stunning Ben Youssef Madrasa. It dates back to the 14th century and was originally an Islamic College. 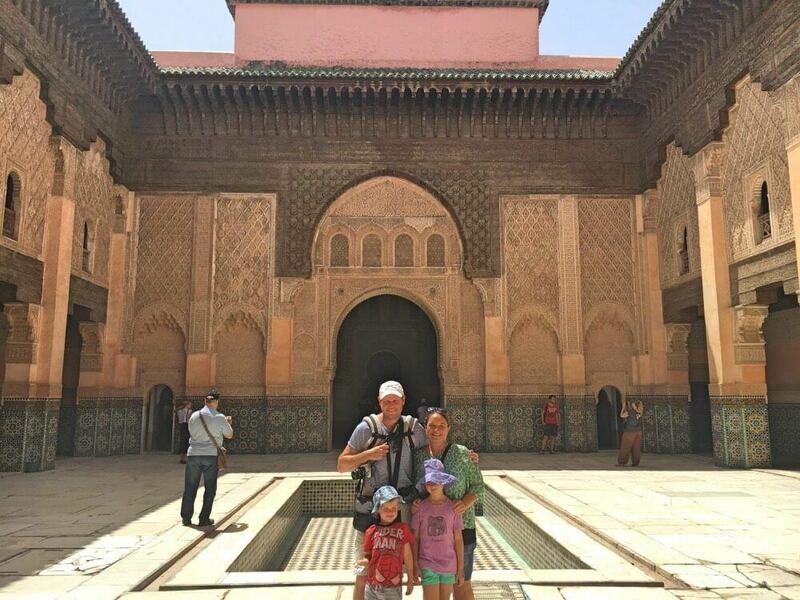 Ben Youssef Madrasa is now open to the public and has the most stunning wooden carvings and tiled courtyards. Our kids enjoyed wandering through and seeing the very small dormitories where the students lived hundreds of years ago. It’s also a great spot for fabulous family photos with all the beautiful tiles as a backdrop, and in our opinion one of the best places in Marrakech. There’s plenty of options for Marrakech day trips but we think a trip out to the Atlas mountains is an absolute must do. It’s an area of outstanding natural beauty and the perfect way to finish your time in Marrakesh. 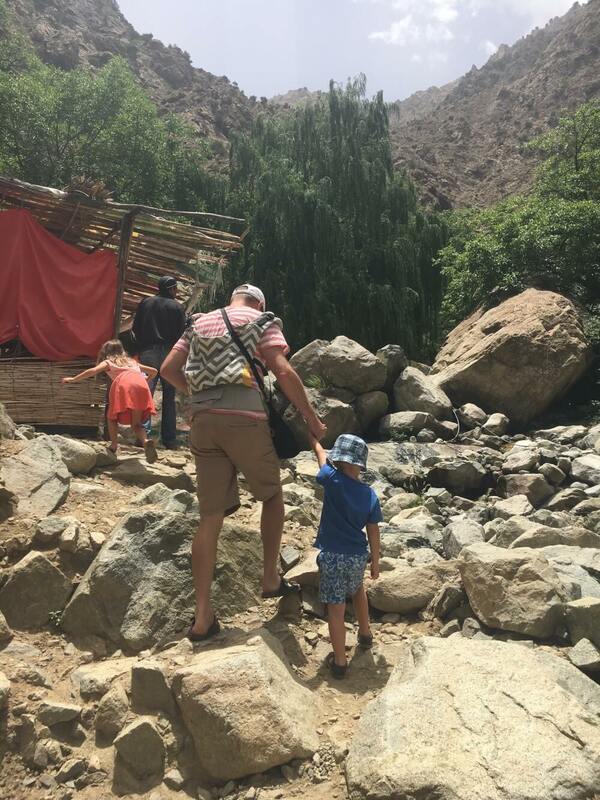 We hired a taxi who drove us out and met with a guide who took us on a short hike up through the Berber villages to a stunning waterfall, which was a great way for the kids to get out and stretch their legs. The hike is really do-able with kids – our 4 and 6 year old managed fine. Some of it is over rocks and boulders so if you have really little ones you might like to carry then in a baby carrier. Admittedly this is something we were a little anxious about before taking our kids to Morocco, and we did wonder if it is safe to go to Morocco. But the overriding answer is – YES!! Firstly the people are so friendly and welcoming, and given that there aren’t huge numbers of families that travel there, your kids are bound to get some special attention and have a fuss made of them. 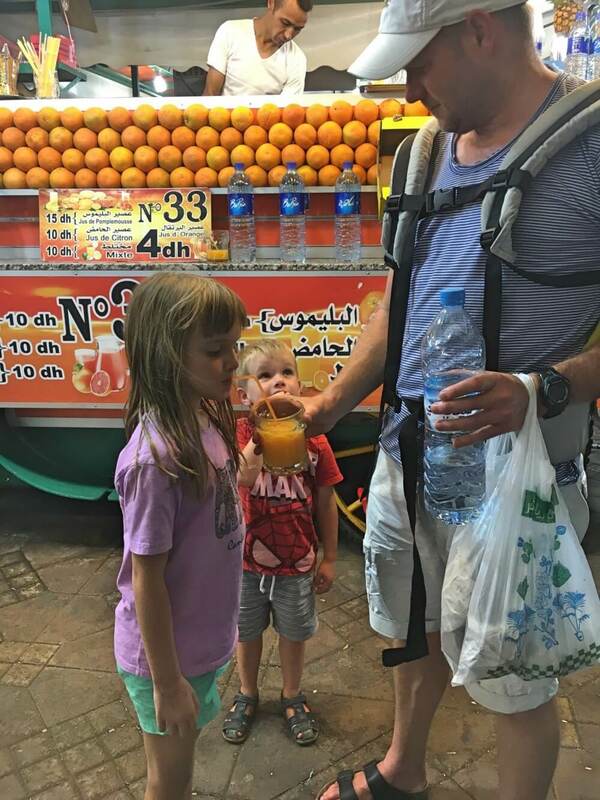 We felt extremely safe the whole time we were there and loved that our children could experience a small taste of North African and Arabic culture. In fact, there’s been many places we’ve travelled in Europe that we felt much less comfortable. Our advice is take the usual precautions – but go!! 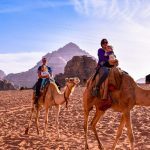 Looking for other Middle East family travel destinations? Check out our guide to visiting Dubai with kids.